Emily M. Andresen, 96, of Oxford Junction, died Friday evening, October 8, 2010, at her home after a short illness. A celebration of her life was held on Tuesday, October 12, 2010 at 10:30 a.m. at Lahey Funeral Home, Oxford Junction. Friends called from 5 to 8 p.m. Monday at Lahey Funeral Home, Oxford Junction. Burial was in the Mayflower Cemetery, Oxford Junction, Iowa. The family has honored her wishes and the body has been cremated. Lahey Funeral & Cremation Services in Oxford Junction was in charge of arrangements. 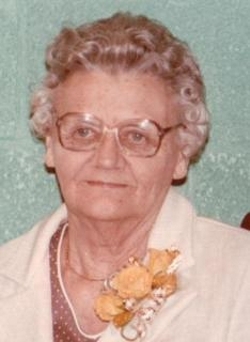 Emily May Vacek was born January 1, 1914, in Oxford Junction, Iowa, to Antone and Elizabeth (Soukup) Vacek. She graduated from Wyoming High School in 1931. She married Max M. Andresen on March 4, 1934 in Clarence, Iowa. They were united for sixty-three years before Max passed away in 1997. They had farmed their entire life in the Oxford Junction area. She was a member of the ZCBJ Lodge #22 of Oxford Junction for seventy-five years. Emily especially enjoyed the outdoor part of farm life with gardening, canning and raising poultry. She will be remembered for her gentle and peaceful spirit and will be greatly missed by all who knew and loved her. Emily is survived by her children, S. June Andresen of Oxford Junction, Betty Andresen of Des Moines, Jerry (Betty) Andresen of Wyoming, Emily (Bruce) Billings of Delhi, and Gene Andresen of Oxford Junction; seven grandchildren, thirteen great-grandchildren and one step-great-grandchild. She was preceded in death by her husband, her parents, three brothers, Frank, Charles and George, one sister Sylvia, and a daughter-in-law, Patricia.